PRO: Acquired by the Riders in October, 2018…signed by the Arizona Cardinals practice squad in September, 2013…selected by the Denver Broncos in the 4th round (108th overall) of the 2012 NFL Draft…selected by the Montreal Alouettes in the 3rd round (23rd overall) of the 2011 CFL Draft. 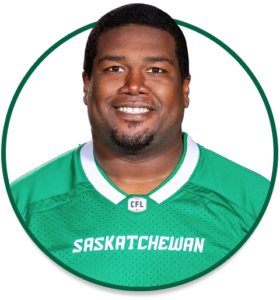 2018: Started three regular-season games and the Western Semi-Final at left guard after being acquired in October…started 12 regular-season games for the Montreal Alouettes, spending time at left guard and left tackle. COLLEGE: Spent three seasons at Baylor University (2009-12)…started all 38 collegiate games while with the Bears…named 2012 All-Big 12 selection…attended Tyler Junior College in 2009.